So, there was this time where I ran 5K’s for a living and wanted to nearly shoot myself. And now, I am running a half marathon in a month. To be fair, I’ve quickly learned that shorter distances do NOT mean easier races. After running a few 10 K’s, I’ve learned they are much easier than 5Ks (for me). Running 3.1 faaast miles means feeling tired, oh, almost immediately. In longer races you can at least “settle” into a comfortably (hard) pace. And I think I can do the distance. Right? I’ve run a few 10 milers, and have felt great. But…I know myself. I’m totally not a competitive person with others (oh sir, you want to steal the ball from me? Okay that’s fine). But I’m particularly hard on myself, and fear I am forming expectations I can’t keep. Sub 2:00 half? Def. Sub 1:40 half? Probably not. But what if my legs fail me on the apparently “really hilly” course? What if I don’t have the endurance to run 7:something pace for more than half the race? And what if…this half makes me hate running? This is what I’m scared of most, I think. So maybe I should shut up and just run it to run it. Feel good and complete the race. Right?! I know I can do it, but I also know I’m going to probably (and stupidly) go out hard and feel very tired for more than half the race. Is this normal? I don’t know how to run a half, so I’m not sure when you’re supposed to feel like you want to pull over. Anyways, here’s the recap of a 10 miler (a distance I randomly chose for myself) I went on today. It went well, despite my evening prior with some lovely ladies and a nutritious dinner: a margarita, two sangrias, and guacamole. I woke up at 7am starved (wonder why), and ate breakfast and enjoyed coffee..and then hit the road. 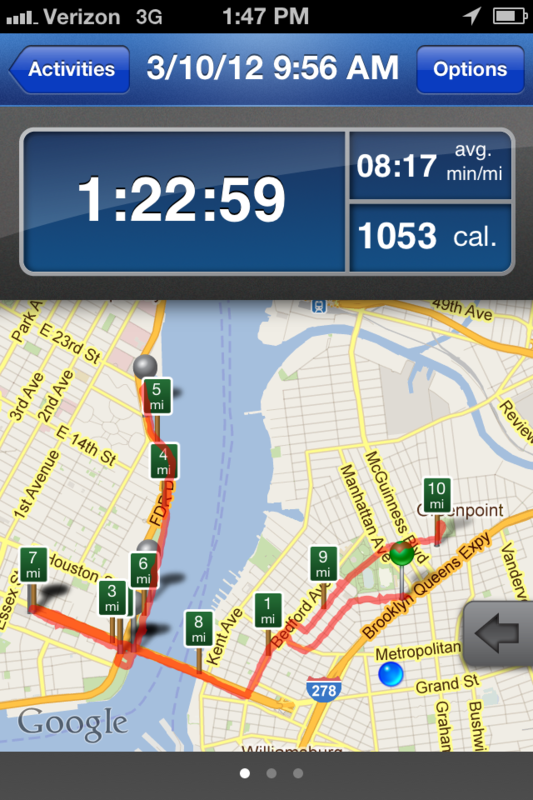 Mile 1-3: My house, to over the bridge and nearing the East River Park. I’m tired (zzz) and my legs are still warming up. I’m sort of gliding and going on auto-pilot. Pretty content. Mile 4-5: Bored of the east river and eager to reach the turnaround point. VERY windy and mad it’s slowing me down. Try to smile at the other runners for fun, and enjoy the sights. Lots of snot rockets (sorryimnotsorry). The cold wind is hurting my lungs. Mile 6-7: Heading back to the bridge, and feel fast. Want to move faster, but also afraid of getting hungry? Mile 8: Confirmed. Starving. Really want to eat a sandwich or seven. Downhill on the bridge makes me happy and distracts my hunger. Mile 9-10. Nauseous. Legs feel great but stomach wants to die. Need to be fed. Run straight to my brothers apartment and drink tea with Kati. Feel much better. Pray there is hot water when I return home. Luke warm. Anyhoo, this run helped me feel better about the More+FItness Half I’m running (April 15th! Largest Women’s half in America! ), so I think I may put my competitive nature aside and try running it super super fast for fun. We shall see. Posted on March 10, 2012, in Uncategorized. Bookmark the permalink. 4 Comments. You are so fast and awesome!!! I am really impressed that you ran 10 yesterday. You are in SUCH great shape for the More. youre the one who motivates me! ! FREAKING AWESOME!! We should run a loop in CP soon, since the race is two loops of the park. You are going to crush the HM! yes!!! let’s do it soon!